Perhaps you heard the recent story about how Maker’s Mark is experiencing a pinch in supply of its bourbon due to unanticipated increase in demand. Well, the story gets interesting quickly, and teaches us some lessons about marketing. Normally, a company might increase prices to offset demand and increase supply. But Maker’s didn’t want to do that. They didn’t want to dilute their brand, which includes a promise to bring a spectacular but relatively affordable bourbon to people who won’t pay super-premium prices. So instead, they chose to dilute their product. But what happens next is where the magic is. Aficionados, fans and probably more than a few trolls opened their laptops, pulled out their phones and railed Maker’s online for this decision. They felt used, abused, and disrespected. They like their Maker’s the way it was and aren’t about to pay the same price for less firewater! This could have been a big nightmare for the company (and it probably was), but instead of making more mistakes, Maker’s listened. And soon, a statement came across the twitter that they shall leave their revered bourbon the way it is, and if the shortage starts to affect supplies in stores, fans will simply have to enjoy the spirit of the hunt for scarce spirits. Several things about this story stand out to me as a marketer. 1. PRODUCT is one of the four Ps of marketing. Product, Price, Place, Promotion! This is Marketing 101. I think Maker’s did an honest job of considering the product by conducting research before giving the green light to this “solution,” as it were. But they should have considered perception of the product in addition to taste. And they needed to consult their biggest fans first. 2. Social listening is vital. In the absence of proactive research about perception, the company did the next best thing by paying attention to what was being said about them online after they announced their plan. If Maker’s hadn’t been listening, they may have forged ahead and alienated their brand advocates. In the statement reversing the decision, they acknowledge that they listened. “While we thought we were doing what’s right, this is your brand — and you told us in large numbers to change our decision.” I love that line. 3. Earnest apologies are always appropriate. Many of the complaints focused on the feeling that consumers were being exploited by a big corporation (Maker’s is owned by Beam, Inc., the second largest spirits company in the US.) Of course, this is dangerous water for a brand like Maker’s, which is still perceived as a scrappy, small-batch, craft bourbon even though it is owned by a large corporation. But leadership did the right thing. They humbly gave an honest account of the decision process and admitted that they got it all wrong. The rest of the statement reiterates the importance of fans’ “trust, loyalty and passion.” All in all, it’s a delightful statement. Very gentlemanly and sincere. So fans have their original recipe back and the brand looks like a responsive, human, and gentlemanly company that makes high-quality bourbon and cares about its customers. So what do you think? Would you have bought Maker’s at a lower proof? 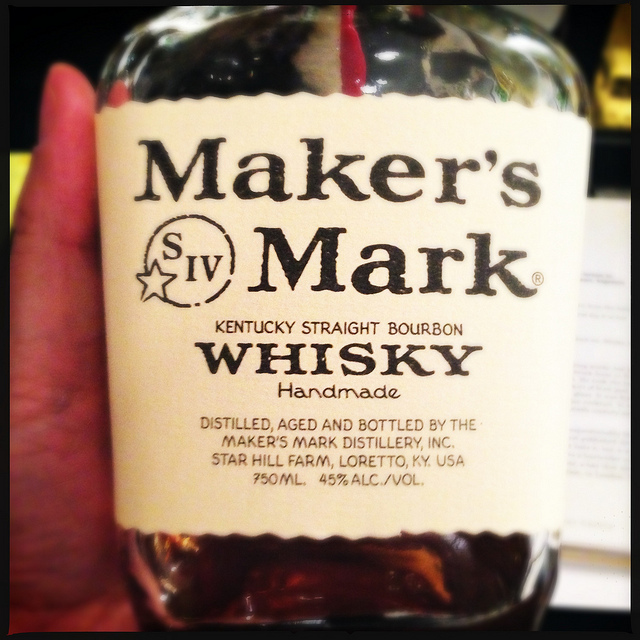 Does this make you want to run out and stockpile some Maker’s Mark — or try another brand? UPDATE: There is even a bit of speculation that the whole thing was a stunt. I don’t think I buy that. I may never have noticed, honestly. I like bourbon, but I am not a bourbon snob. However, I am susceptible to the snob factor when reading reviews. I’ll admit it. The real kicker would have come some day when I was flipping through a snooty food magazine or some blog about good bourbons, and they would have said something like, “Makers used to be good, but once they diluted their brand, it’s an ify buy. If you want a real hand crafted bourbon try (insert fancy bourbon name here).” And then I might have purchased a different brand of bourbon if I were buying a bottle for my house. It isn’t the current problem of people abandoning the brand but the future smearing by those spirit snobs out there that might have given them real problems in the long run. Indeed! Maker’s is a great brand all-around and their handling of this situation just reiterates that fact. Thinking about this story has made me crave a sip of bourbon for the past few days, for sure! And is there anything better than bourbon balls at Christmastime?